Sofa is the main place in the apartment, it collects in the evenings the whole family and just happy with their beauty and convenience. To care for furniture is not easy. 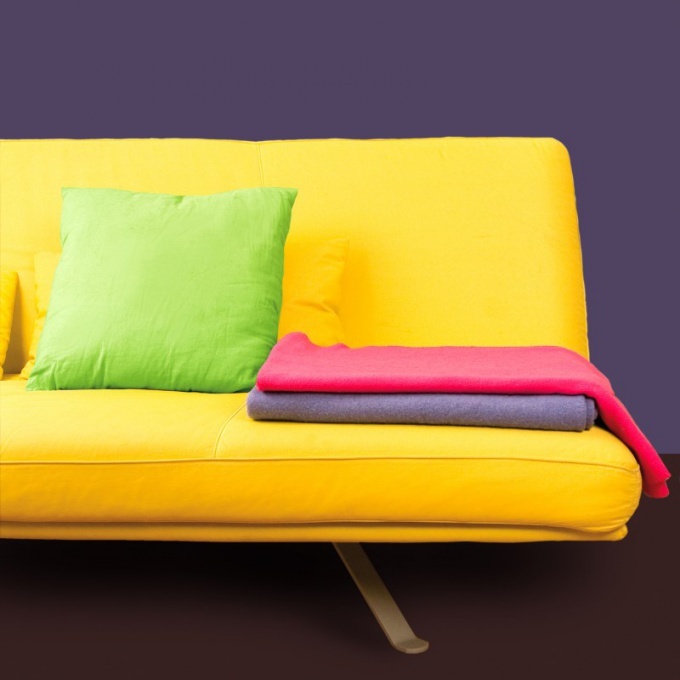 If there are stains, remove them with caution, without damaging the upholstery. Take chalk, grind to a powder and sprinkle on fresh oily stainand leave for 4-5 hours, then swipe a brush. Dilute potato flour with water until the consistency of porridge. Put it on the stain, wait 2 hours. Remove the part and wipe dirty place with a cloth soaked in gasoline. You can warm the flour on a slow fire, mixed with gasoline in a ratio of 1:1 and apply on the spot. Remove the solution with a cloth dampened with warm water. Sprinkle the stain with talcum powder on the upholstery, place the parchment and iron with a hot iron. This method is good to use, if the coating is removable. Then process is followed by the fabric and on the reverse side. Use for washing dishes, apply liberally to the pollution and wait for 15-20 minutes. Then rinse with warm water. Try not to RUB the stain, do not use force when cleaning, rich foam thoroughly rinse, wait until the material dries. Sew from linen fabric pouch, put the warm sand and tap on the spot. The composition will absorb the grease from the upholstery of the sofa and eliminate the stain. Buy spray lotion for cleaning upholstery or car interior, read the manual and proceed with removal. Buy one lemon, squeeze the juice from it and mix with two tablespoons of vinegar. The solution soak the stain and remove the excess with a dry cloth. Bring a fat spot can be large dry salt, sprinkle it to the stain and leave for 3-4 hours, remove the bread crumb. Contact the dry cleaning, you can take spot in a short time. Might have to invite a specialist at home. In addition, these institutions usually know processing technology of various materials, so the procedure of getting rid of grease stains spend carefully and effectively. The stain should withdraw from the edges of the stain to the center, avoiding increasing the area of contamination. If the upholstery is leather, before processing wipe it with a dry cloth.